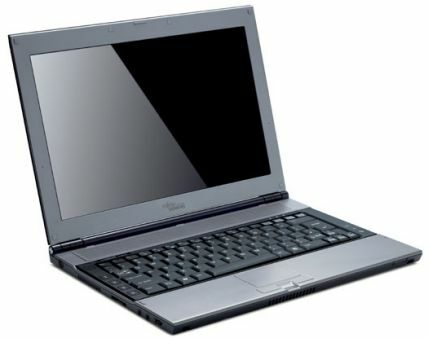 Fujitsu LifeBook Q2010 is slim, thin and light 12.1″ wide Intel Centrino LifeBook laptop weighing just one kilogram, and with a slender thickness of just 20mm. LifeBook Q2020 features unique, piano lacquer finish with stylish design, Titanium hinges, magnesium housing, shock-mounted hard drive with accelerometer, RoHS compliance, Fingerprint Recognition Technology, Trusted Platform Module v1.2, integrated dual digital array built-in microphones, Wi-Fi and Bluetooth connectivity, docking station with DVD burner and runs on Windows XP Pro with Windows Vista Capable. NotebookReview reviews Fujitsu LifeBook Q2010 and concludes that if you’re looking for a small laptop for your business traveling, don’t hesitate and spend the money! If you can afford this, I’m sure you won’t regret it. It has all the security you can want and the portability is truly unbeatable. If you’re working at work and at home, just leave the docking station at work, which makes the desktop complete. If you want to stand out from the crowd, you will have to spend a lot of money to achieve that, but the Q2010 certainly does this.